The occasion of their composition, I would later learn, was a formal academic disputation of the Augustinian order, over which Luther presided in April of 1518. The theses and their explanations repeatedly cite Paul’s letters in light of the Augustinian theology that was flourishing at the time, in reaction to the major scholastic movements of the preceding centuries. Among those present at the disputation were friars who would bring the Reformation to new cities in the years to come. It is tempting to wonder what might have happened to these ideas if they had not been entangled with Luther’s concurrent attack on the practice of indulgences, which apart from its theological consequence was also an attack on the cornerstone of Pope Leo X’s capital campaign. The extreme Augustinianism of the theses is at once less immediately threatening and more radical than the critique of indulgences. Perhaps these debates would have played out very differently if they had been confined to academic theology, instead of splashing across a continent-wide crisis of the church’s polity and economy. As one whose engagement with that academic theology is strictly amateur, however, I found in the Heidelberg theses something like a Rosetta Stone of my own preoccupations. I had started years before with Augustine, from whom I learned angst and guilt. And I had already leaped ahead to Kierkegaard and Bonhoeffer, from whom I had learned about paradox and contradiction. Luther, in these theses, connected it all. What had fascinated me in theology, from the start, was something too severe, too extreme for the common metaphors of healing, enlightenment, amelioration, gradual improvement: it was the image of being created anew, put to death and buried and resurrected. Here, in Luther’s theses and their “theology of the cross,” was something that could make sense of very little, except for the stunning reversals in Scripture, where the first is last, the cruel brothers are forgiven, the hungry are filled and the rich sent away empty, the rich man’s gate becomes a fiery prison, the scrupulous search for worthy hungry to feed becomes the surprise condemnation, and the cross becomes the tree of life. This is an even more penetrating claim that Luther himself indicates. The cross, as was not much acknowledged in the theology of Christendom, was a punishment reserved by Roman law for non-citizens. It was not the civil sword that punishes wrongdoers as part of the political community; it was an act of public terror that degraded and dehumanized people outside of that community. It was significant that Jesus did not die by the civil sword, or by a lingering fever, or a criminal ambush–all of which would have served to balance the divine ledger or embody an ideal of abstract suffering. Jesus died under a very human kind of curse. Reason still rebels at finding our righteousness and redemption in such a thing. So the theologian of glory is a persistent presence in the church today, and the theologian of the cross is always needed. There is always a temptation to insist that the contradiction between the world and a God revealed in a viciously executed Jewish messiah is not quite total, not entirely incapable of compromise and accommodation, not yet wholly resistant to our modes and methods of wisdom and understanding. Our noble theologies, our beautiful art, our civilized institutions, our just politics, and pious modes of living have to count for something. The cross can be brought into those systems somehow, given a place of prominence, acknowledged as the completion of an otherwise admirable worldview. Our need can’t be so great as to sweep all of that away. And perhaps it isn’t. Perhaps the genius of the Heidelberg theses is strictly literary. Augustine, after all, argued that the difficult passages in Scripture ought to be interpreted in light of the clearer ones, and not the other way around. We tend to read law and philosophy as Augustine recommends reading Scripture. Searching for the unaccounted exception or the scandalous reversal is what we do when we read, say, Hamlet. But for me as a pastor, a writer, and a Christian, and I suspect for the history of theology more generally, Luther’s theology of the cross held Christian thought open in a critical way. Christians, Luther would later write, must be regarded as the worst of all people, and be persecuted and punished solely for wishing to have Christ and none other as their head. The eschatological and political marginality of the early church–its Messianic severity–is left as a possibility in this theology, even if only by analogy. It is a possibility taken up in Christian existentialism, in liberation theology, and in the best of Christian political and cultural engagement in the world. 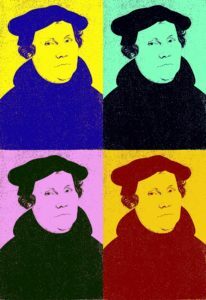 The cross that cannot be fully captured or concluded within any moral or intellectual system, or any institutional form, is Luther’s great contribution to Christian thought.